Hey y'all! How are y'all doing? I've been really busy with my dearest mom over the last couple of days. For one whole week, we shopped and shopped and shopped till we dropped! See, we went to all the shopping centers in town EVERYDAY, from day to night. At the end of the day, I have zero energy to on my laptop and peek at my blog! Needless to say, there was no time for me to blog, to visit your blog, to drop EC cards, to read my emails in a very hectic week. I do apologize for not updating or replying your comments. Oh, thanks for dropping by my blog, too especially Mariuca who dropped by every single day! Well, my mom has gone back to Sabah happily yesterday afternoon with lots of branded shoes and handbags. 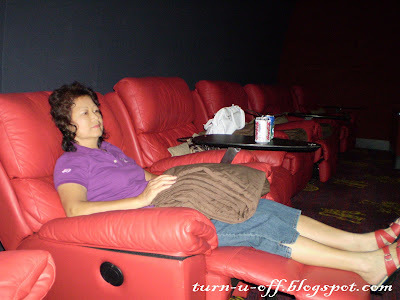 Mom watched Mamma Mia at GSC Signature - Gold Class, where the tickets cost RM60 each. "Good enough to snooze in!" Till then, I will post more soon! Sorry can't drop EC. Don't know what's wrong with the EC website. Can't even log in! There is nothing like spending time with mum. We truly understand. I am glad you are having fun,must be too exhausted to blog. Take care and have a great week. Have fun....your mom sure looks contented with all that shopping, ha ha. Lee. Ha Ha, looks like you had a good time shooping with your mom. Cheers! wowwww, so loaded-nye! shopping from 1 place to another. wah... must be spending a lot of $$$. :) I would not have energy to shop everyday til a week. but I can log in to EC website..
hey! thanks for dropping by...I hope you have a great week too! It's alright Haaziq! Good luck on your exam. I'm sure you'll do great..
RM60 is just not worth it, right?! LOL! Oh I'm so glad you had a visit with m. and it sounds like you two had a blast. As for me my real life has been crazy lately too. I don't know how much she spent in total but me, not much la..hahaha..
yup, Gold class is RM60! not worth it, eh? Ya..that should be the way..after all...fly on the way from Sabah...must go for it. Glad u and your mom had fun.